Long ago, before the first winter solstice, all the plants began to prepare themselves for their winter sleep. Only this time, the plants were extra worried. It was said that there was going to be a really cold spell. In the end, all the plants fell asleep, all that is, except for a lingonberry bush. He didn't know how to. The clouds warned the lingonberry bush that he would freeze to death if he didn't sleep soon. Desperately the lingonberry bush asked the celestial sphere to help him to survive the cold. Celestial Sphere replied: "during the dark part of the year the days are already difficult enough for me and I have to protect what I already have, so I don't lose it". At that same moment a winter elf passed by. The elf was appalled by what he'd heard. He looked at the lingonberry bush and said: "I own nothing, but I'll warm you with what I have." 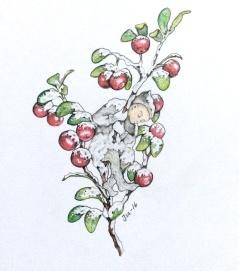 The elf climbed on to the lingonberry bush and awaited the cold weather. He held on to the bush as long and as hard as he possibly could. Eventually, due to the freezing conditions, he couldn't hold on anymore. He let go and fell lifeless into the icy snow. The lingonberry bush was devastated by the loss of his friend, but the memory of his good deed also gave the bush strength. Thanks to the help of the winter elf the lingonberry bush survived the coldest winter in history and even today lingonberry bushes grow in the snow to honour the elfs good deed. There are many in our world who are struggling for survival and for those who are suffering their needs are huge. Don't forget that you can help in various ways: "If you have a lot, then give from your wealth, and if you have little, give from your heart. " Lingonberry bushes can survive -40grader Celsius. Merry Christmas to you all!